If the point of a documentary is to get people to critically think about an issue, Vegucated certainly met its goal for me, though it caused me to scribble furious notes and get riled up more than any other documentary I’ve watched so far. 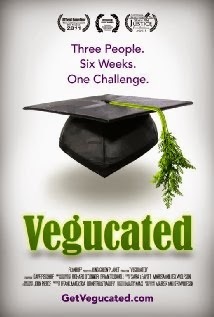 Vegucated follows three people who agreed to go vegan for a period of 6 weeks, undergo a health screening before and after, and be educated about why someone should choose to be a vegan. Childish cinematography aside, I didn’t want to hate this film. I felt like it meant well, but veered off into a lot of what I felt was misleading information. First, my disclaimers. I think anyone should be able to pursue the diet of their choice. I respect vegetarians and vegans for their diet choices and see the myriad of benefits diets such as these provide, not only for animals and the environment, but for individual health. However, if the choice to live by those diets involves twisted logic (which is then used to attack what I’d call an ethical omnivore diet), that’s where I have an issue. When the three participants decided to go vegan for the purposes of the film and were beginning the transition, the filmmaker/narrator emphasized that they should look for vegan versions of their favorite products to ease the transition. This film was so full of processed foods, it made me ill. I’m not sure why someone would choose to give up dairy or eggs, only to constantly eat heavily processed foods with artificial additives and GMO soy. Processed foods have a huge impact on the environment and vegan versions of regular processed junk are not at all more healthy. To wave GMO soy milk and veggie/soy burgers packed with a list of 30 ingredients and claim that it’s the epitome of health is misleading. If I saw one more person waving a container of Earth Balance around acting like it was health food, I was going to scream. Along those same lines, the filmmaker points out all the wonderful restaurants where you can eat vegan – like Subway! and Johnny Rockets! My question is this – even if you eat a vegan option at Subway, you are supporting a corporation that does not support environmentally sustainable practices, and sources the meat it serves to other people from the worst of the factory farms they claim to not support. So it rings false to me when you claim veganism is good for the environment, but give your money to the exact corporations that destroy it. There was a great deal of footage from factory farming operations in this film, which in some ways is great. I applaud any effort to get people to stop eating factory farmed meat. I’ve written about that before, as well as made clear my support for defeating Ag-Gag laws. If the only meat available were from factory farms, I’d never eat another bite for the rest of my life. Factory farms are atrocious and disgusting in the extreme and should not even be allowed to exist. However, the filmmaker/narrator doesn’t just stop there with farms – she visits a “small, family farm” and claims it’s just as bad as factory farms. No kidding. The “small, family farm” that she showed had a CONFINEMENT SYSTEM for its chickens. The farms where we source our meat absolutely would never use a confinement system. I’ve been there and seen it – I don’t have to go undercover with a camera because they openly welcome people to visit. While I think people can legitimately have ethical issues with eating animals, it is unfair to paint all meat eaters as people who allow animals to suffer. Not everyone who drinks milk sources the milk from a cow who had her calf ripped away from her at birth. Another argument that doesn’t hold up is that all animals raised for food contribute to environmental decline. It’s true that factory farmed meat is terrible for the environment, and the majority of grain production in the country (as well as most of the antibiotics, incidentally) goes to raising these animals. Last time I checked, our farms allowed their cattle to graze on pasture, not grain shipped in from across the country. They also use their manure to fertilize fields, not trap it in a waste lagoon and then spray it everywhere, contaminating water supplies. They use rotational grazing methods that are sustainable. They don’t destroy the earth – they nurture and protect it. And this doesn’t even touch the health portion of this film. Yes, in 6 weeks the three people each lost a few pounds and saw benefits in their blood pressure and cholesterol. And it’s a fact that a plant-based or plant-heavy diet that’s low in saturated fat and cholesterol is great for your health. But these people were not active and also continued to eat junk food – but it was vegan junk food, so it was “healthy” (ooh, Teddy Grahams are vegan!). These people are obviously not representative of all vegans, but to promote it as a healthy lifestyle while still encouraging people that they can eat processed cookies is wrong. “Vegan” doesn’t equal health any more than “organic” equals health. Ultimately, to paint all farms and meat eaters with such broad strokes is irresponsible. I know many vegans and/or vegetarians that eat a whole foods diet and don’t rely on processed garbage as an “easy way out.” But this film made me feel like I was on one side of a war, good (vegans) versus evil (everyone else). In actuality, I think an ethical omnivore has a lot more in common with a vegan than most people would assume – both are conscientious eaters, aware that what we eat involves much more than just mindless bites. So why can’t we just get along? Mark and I spent Friday at the Farm to Table Pittsburgh conference. Though we found that we were familiar with most, if not all, of the ideas and vendors presented there, we were very happy to support the conference with our tickets in hopes that each year it will continue to grow and get larger. We went to two different presentations in the morning. First, we saw Nigel Tudor from Weatherbury Farm (where we get our beef) talk about the benefits of grass-fed beef. Though we already eat only grass-fed beef and know and appreciate its benefits, I learned a few new things. The mother cows will give birth to calves in mid-May, and that is the time of year when their nutrition requirements are at their peak. Perhaps not coincidentally, mid-May is also the peak time of the pasture growth. Whatever pasture the cows cannot keep up with is mechanically grazed at the farm and stored for winter. The cows on the farm are rotationally grazed so as not to over-graze certain parts and to allow the pasture itself to thrive, including all of the cows’ favorite types of grass. The average American eats around 66.5 pounds of beef per year. If someone switched to grass-fed beef only, and made no other dietary changes, within that year he/she would see a savings of 17,733 calories, or about 6 pounds a year. Did you know that cows can self-medicate? They know which types of grass to eat when they have specific ailments, like an upset stomach(s). That’s why having a variety of grasses in the pasture is important and monocultures don’t work. Pastures with a high level of organic matter are also less prone to flooding, since organic matter holds 8 times its weight in water. The second presentation was on fermented foods by Scott Grzybek of Zukay Live Foods. I’ve been interested in fermentation since I first had kombucha, and I attended a class at Mother Earth News Fair last year on making your own. The presentation we saw Friday focused mostly on the basics of fermenting and the benefits of good bacteria. The more raw foods I consume, the better my digestive health, so I didn’t need any convincing. Probably the best thing we learned was that you can’t use city water to start your ferments because of its chlorine content, which kills off bacteria. Mark realized it was probably why his sourdough starter wasn’t really going anywhere, so we’re excited to try it again with spring water. I realized that I’ve been holding back on trying a few new things, like making my own sauerkraut and brewing kombucha at home, because I was afraid to mess up. If anything, this Farm to Table conference gave me the confidence to just go for it and try it. What have I got to lose? In my link roundup on Friday, I will post links to some of the great businesses we found at the conference and also share a recipe we picked up.